Dear friends and community, PAWA is proud to be publishing Janice Lobo Sapigao's full-length debut collection, microchips for millions, which will be released this fall 2016.
ma gets up at four a.m.
We are asking for community support, in the form of sponsorship for this title! As you may know, publishing is a costly endeavor, and so anything you are able to contribute will be much appreciated! 100% of proceeds will go towards production of Janice Lobo Sapigao's first full length book. You will be acknowledged on the publication's Acknowledgments page. Need some gifting ideas? How about some Filipino American authored books? Friends, here are some book titles, in case you are looking for Filipino American literary works as gifts! Alvar, Mia. In the Country: Stories (2015). Barot, Rick. Chord: Poems (2015). Biala, Arlene. Her Beckoning Hands: Poems (2015). Buell, Evangeline, et al. Beyond Lumpia, Pansit and Seven Manangs Wild: Stories from the Heart of Filipino Americans (2014). Cruz, Rachelle and Melissa Sipin. Kuwento: Lost Things. An Anthology of New Philippine Myths (2015). de la Paz, Oliver. Post Subject: A Fable (2014). Enrado, Patty. A Village in the Fields: A Novel (2015). Igloria, Luisa. Ode to a Heart Smaller than a Pencil Eraser: Poems (2014). Javier, Paolo. Court of the Dragon: Poems (2015). Kelly, Erin Entrada. Blackbird Fly (2015). Melnick, Lisa Sugiutan. #30 Collantes Street: A Divinely Driven Journey to the Philippines (2015). Penaloza, Michelle. landscape/heartbreak: poems (2015). Pineda, Jon. Little Anodynes: Poems (2015). Reavey, Amanda Ngoho. Marilyn (2015). Reyes, Barbara Jane. To Love as Aswang: Songs, Fragments, and Found Objects (2015). Roberts, Mg. no so, sea (2014). Robles, Tony. Cool Don't Live Here No More: A Letter to San Francisco (2015). Suzara, Aimee. Souvenir: Poems (2014). Tabios, Eileen. Invent[s]tory: Selected Catalog poems and New (1996-2015) (2015). Tizon, Alex. Little Big Man (2014). PAWA is pleased to announce the publication of To Love as Aswang, by Barbara Jane Reyes. Book Description: The Philippine aswang is a mythic, monstrous creature which has, since colonial times, been associated with female transgression, scapegoating, and social shaming, known in Tagalog as hiya. In the 21st century, and in diaspora, she manages to endure. Barbara Jane Reyes‘s To Love as Aswang, the poet and a circle of Filipino American women grapple with what it means to live as a Filipina, or Pinay, in a world that has silenced, dehumanized, and broken the Pinay body. These are poems of Pinay tragedy and perseverance, of reappropriating monstrosity and hiya, sung in polyphony and hissed with forked tongues. To Love as Aswang is award-winning Pinay poet Barbara Jane Reyes's fourth full-length poetry collection, and it is available for course adoption. Please contact us at pawa@pawainc.com if you are interested in teaching this title. Kuwento: Lost Things, a new anthology of poetry, fiction, and nonfiction inspired by Philippine mythology, edited by Rachelle Cruz and Melissa Sipin, and published by Carayan Press, launches this Friday in San Francisco! Are you interested in reading Pinay Lit, but you don't know where to start? Here is our first recommendation: the very prolific Eileen R. Tabios. Below are some links to reviews of her works. Saturday 06/23/2013 at 2 pm. Philz Coffee Noe Valley 4298 - 24th Street, SF. You are invited to the official release and signing event for Bruce's newest book, "But I Don't See You as Asian: Curating Conversations about Race." Held at the coffee house where most of the writing occurred, get some coffee, buy a book and see the signs of relief on the faces of his family and friends. Stop by any time during the two hour timeframe. There is not much gathering room at Philz Coffee Noe Valley and there will be no formal program*, but since a majority of the book was written fueled by Philz coffee, it seems only appropriate to officially release the book at this great San Francisco business. Books will be available at the event, but you can also purchase a print copy on Amazon. There are also electronic versions for your Nook or Kindle and if you were a Kickstarter supporter, I can have yours waiting. Thank you in advance and please do feel free to share this invitation with others who might be interested in attending the event or reading the book. *There may be door prizes awarded, there is a nice park across the street where folks can hang out and there are plenty of great eateries in the area for folks to visit before or after stopping by the signing. 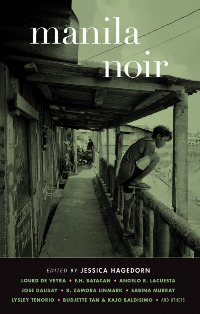 Launched with the summer ’04 award-winning best-seller Brooklyn Noir, Akashic Books continues its groundbreaking series of original noir anthologies. Each book is comprised of all-new stories, each one set in a distinct neighborhood or location within the geographical area of the book. Original stories by Lourd De Veyra, Gina Apostol, Budjette Tan & Kajo Baldisimo, F.H. Batacan, Jose Dalisay Jr., Eric Gamalinda, Jessica Hagedorn, Angelo Lacuesta, R. Zamora Linmark, Rosario Cruz-Lucero, Sabina Murray, Jonas Vitman, Marianne Villanueva, and Lysley Tenorio. One of the most populous cities in the world, Manila provides the ideal, torrid setting for noir. It’s where the rich rub shoulders with the poor, where five-star hotels coexist with informal settlements, where religious zeal coexists with superstition, where “hospitality” might be another word for prostitution, where politics is often synonymous with celebrity and corruption, where violence is nothing out of the ordinary and pretty much anything can be had for a price. “Manila is not for the faint of heart. Built on water and reclaimed land, it’s an intense, congested, teeming megalopolis, the vital core of an urban network of sixteen cities and one municipality collectively known as Metro Manila. Population: over ten million and growing by the minute. Climate: tropical. Which means hot, humid, prone to torrential monsoon rains of biblical proportions. I think of Manila as the ultimate femme fatale. Complicated and mysterious, with a tainted, painful past. She’s been invaded, plundered, raped, and pillaged, colonized for four hundred years by Spain and fifty years by the US, bombed and pretty much decimated by Japanese and American forces during an epic, month-long battle in 1945. Yet somehow, and with no thanks to the corrupt politicians, the crime syndicates, and the indifferent rich who rule the roost, Manila bounces back. The people’s ability to endure, adapt, and forgive never ceases to amaze, whether it’s about rebuilding from the latest round of catastrophic flooding, or rebuilding from the ashes of a horrific world war, or the ashes of the brutal, twenty-year dictatorship of Ferdinand Marcos . . . Many years have passed since the end of the Marcos dictatorship. People are free to write and say what they want, yet nothing is different. The poor are still poor, the rich are still rich, and overseas workers toil in faraway places like Saudi Arabia, Israel, Germany, and Finland. Glaring inequities are a source of dark humor to many Filipinos, but really just another day in the life . . .
To listen to a radio interview with editor Jessica Hagedorn on The Blood-Jet Writing Hour, please click here. Before I ever had a name for it, I was already engaged in the work of centering Pinay narratives and voices. For the past two decades, I have thought of my poetry as doing just that; I am a Pinay poet and my speakers and/or personae are Pinays thinking about their own lives, telling their own stories. I always thought it was that simple. But I am frequently asked whether writing about Pinay-ness has limited me. Being Pinay is a fact of who I am. I was birthed by a Pinay, and raised by Pinays. Pinays have given me my value system. My Pinay-ness is the filter through which the world views and handles me, cross references me against what they (think they) know about people in the world who look like me. A San Francisco Bay Area author’s collection of his favorite recipes learned from his Filipino mother’s kitchen, picked up from his world travel, and developed from his association with other food enthusiasts. With each pictured recipe comes a personal story, a pinch of trivia and a dash of humor — all meant to engage the reader in some exciting kitchen talk or dinner conversation. Come in for the stories. Stay for the recipes. Paperback | Full Color | 80 Pages, 6″ x 9 ” | $21.95 | The Perfect Holiday Gift! Please rsvp (MyBayKitchen@gmail.com) and reserve your seat as space is limited. Meritage Press is delighted to release a first book by an author just shy of her 83rd birthday: DAWAC and Other Memoir-Narratives by Beatriz Tilan Tabios. DAWAC presents Mrs. Tabios' childhood memories of Babaylans (indigenous Filipino healers) as well as surviving the Japanese invasion of the Philippines during World War II. DAWAC describes many incidents that would be lost today without the book's existence. They also make history come alive, as only the testimony of someone who lived through the experience (versus a historian's or academic's account) can accomplish. An example is a section that describes how she and her family ran to the forests to hide whenever the Japanese army approached their town. As it turned out, it was during those times of hiding when she ended up being introduced to Greek poets, because Homer's Iliad was a "little" book light enough to carry as she fled. Beatriz Tilan Tabios received her B.A. with English as her major from the Silliman University in Dumaguete, Philippines. She developed her love for poetry as a sixth-grader reading Homer, William Shakespeare, John Keats, Alexander Pope, William Wordsworth and Samuel Coleridge while trying to survive World War II. She would further develop her appreciation for literature as a college student instructed by poet Edith Tiempo, the first woman to receive the title of National Artist for Literature in the Philippines. Critic and fictionist Dr. Edilberto Tiempo, then the head of Silliman University’s English Department, encouraged Mrs. Tabios to continue her study of English and American literature. As a result, Mrs. Tabios wrote her Master of Arts thesis, one of the earliest investigations, regarding Filipino literature, of “(The Use of) Local Color in Short Stories in English.” Later, Mrs. Tabios taught English literature at Dagupan College (now University of Pangasinan) and University of Baguio, before becoming a teacher at Brent School, a boarding school initially built for children from U.S.-American military, missionary and gold-mining families stationed in the Far East.